Who doesn’t love Stranger Things? The 1980’s nostalgia fuels sci-fi adventure Netflix released last year was a complete breath of fresh air. 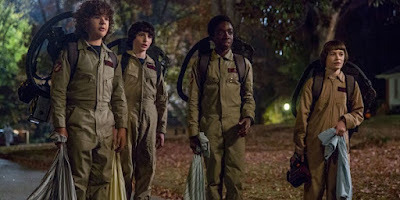 The kids were awesome, Eleven (Millie Bobby Brown) was arguably one of the first badass female superheroes in our current age of superheroes, and the show did everything completely right. It’s crazy to imagine that many networks turned down the Duffer Brothers for this show before Netflix gave them a chance. With little advertising, Stranger Things became a pop culture phenomenon its opening weekend. Of course, we are going to get a season two. Everything’s not all better in Hawkins’ Indiana. Eleven might have gone elsewhere, but Will still has whatever issues he has from his time in the Upside-Down, and it looks like we’ll be exploring that world much more in season two. At their Hall H panel at Comic-Con, the Stranger Things season two trailer was released. It looks like Will is the key this season as he now has a connection to the other dimension. That doesn’t mean that Eleven isn’t going to be there. Time will tell. Stranger Things will hit Netflix October 27th, just in time for Halloween.